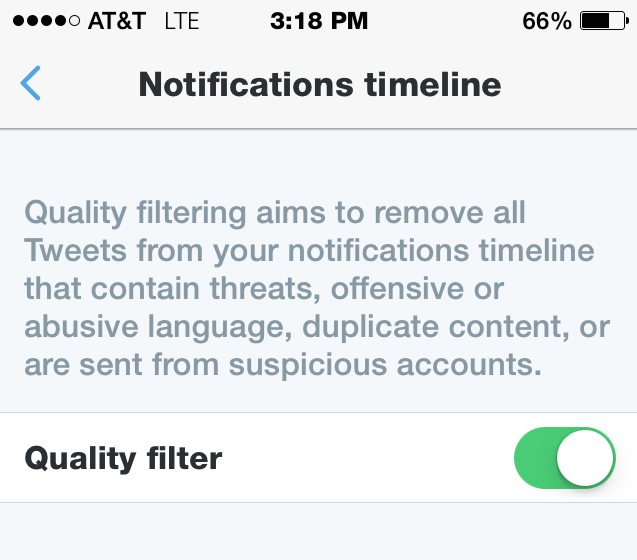 Quality filter allows verified users to hide tweets in notifications containing threats, offensive or abusive language, duplicate content or that are sent from suspicious accounts, similar to the old “filtered” option users had previously. The renamed feature appears to be still rolling out. Spotted by Anil Dash, co-founder at ThinkUp, the new option is available under the notifications tab and allows verified users to hide offending tweets. It’s not clear if it’s going to roll out to the wider Twitter service in the future, but we certainly hope it does. Previously, verified users could enable a “tailored” timeline that hid spam, this option appears to replace that and functions in almost the exact same way, however it now works across all notification types. The new feature comes just weeks after Twitter’s CEO admitted that the company does not deal with abuse on the service appropriately and promised that the company will do more to help in the future.